The walleye is now found throughout the US even though its initial distribution was among the waters of the eastern and southeastern states. Often found in rivers and streams it prefers moderately deep lakes with gravel, rock or sandy bottoms. Walleye fishing offers a blend of the fishing trip excitement with the anticipation of at tasty meal for the successful angler. Walleye is a favorite of the white meat, fresh water fishes. Walleye spawn in spring and when the option is available, will choose to migrate from the lake up into feeder streams to spawn. If this option is not available they seek out shallow bars or shoals with clean bottom surfaces near deep water. The toothy walleye will eat virtually anything they can catch and get in their mouth. They prefer small fish and will eat crustaceans, worms and insects. Try fishing for walleye from sundown to midnight, particularly during the heat of summer. 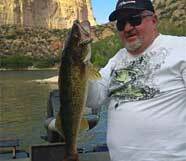 Visit the walleye fishing videos section for tips, ideas and great fishing action. Fish for walleye with live bait, spinners, spoons, crankbaits, jerkbaits, small spinner baits as well as plastic worms and grubs. Trolling is a very effective way to fish for these tasty fish. Top Baits: Small crankbaits, small jigs and plastic worms. Fish shallow to moderate depths as the walleye move into the shallows to spawn. Gravel ledges, points and submerged humps in protected areas are prime holding areas. Top Baits: Crankbaits, Jigs and plastic worms. Fish shallow in the mornings and evenings and move deeper as the sun rises. Use lures that mimic crawfish as this is a favorite food of the walleye. Follow points and rocky or gravel structure deeper until you establish the proper depth. Top Baits: Jigs, crankbaits and spoons. Fish shallow to moderate depths in the mornings and evenings. As the sun rises move deeper toward outside structure and use small spoons or jigs. Top Baits: Jigs, spoons and plastic worms. Try moderately shallow depths in the mornings then move deeper as the sun rises. Walleyes are less active in cold water, so move your bait in a slow, easy to catch manner and fish deep structure. Walleye fishing waters by state. If you have information, articles or photos relating to walleye which you would like to see published here, please submit them for consideration. We will gladly give you credit for your contribution. Walleye articles can be listed under the walleye category on the fishing articles page or can be listed under fishing articles in a specific state. If you offer walleye fishing guide services, you can choose listing options to promote your guide services, by visiting our advertising section. Walleye Fishing - All About Fishing for Walleye.